Though work on the state government's ambitious PRTS (public rapid transport system) project is yet to begin, the authorities have once again changed the route plan. This is the second time in the last few months that the route has been altered. An artist’s view of the PRTS over the road leading to Jallianwalla Bagh in Amritsar. An official residence for Congress Legislature Party (CLP) Leader Sunil Jakhar in Chandigarh continues to prove elusive with former Chief Minister Rajinder Kaur Bhattal adamant on not vacating her ministerial bungalow despite having been served an eviction order. Hundreds of cases of change of land use (CLU) are likely to be addressed now with the BJP prevailing upon its alliance partner, the SAD, to reverse the government decision to deposit funds collected from CLU approvals to the state exchequer. The New and Renewable Energy Policy-2012 approved by the Punjab Cabinet today will attract an estimated investment of Rs 18,000 crore, besides providing direct and indirect employment to more than 25000 youth in the state. People's Party of Punjab (PPP) president Manpreet Badal today said his party was yet to hold talks with the Congress over forming an alliance for the coming Lok Sabha elections. Deputy Chief Minister Sukhbir Singh Badal today said Punjab would become the only state in the country that would have 90 per cent of its highways four-laned by next year. Following the death of two safai karamcharis due to asphyxiation while cleaning a sewer disposal point near Rahi Basti here recently, vice-chairman of the National Commission for Scheduled Caste (SC) Dr Raj Kumar Verka has instructed the Barnala Deputy Commissioner and the Senior Superintendent of Police (SSP) to register an FIR against the contractor and the officials concerned. Forest Minister Surjit Kumar Jayani has ordered the complete reorganisation of the forest beat system which has been prevailing in the Forest Department since the British times. The beats are the lowest organisational units of the department held by forest guards. Despite the Taliban's threat to target Indians post-Kasab hanging, over 2,000 Sikh pilgrims, including an 889-member SGPC jatha, today left for Pakistan to celebrate the birth anniversary of Guru Nanak Dev at historic shrines. Taking serious note of charges made by students that public buses are not stopped for them, Punjab Transport Minister Ajit Singh Kohar today directed all drivers to ensure that students are allowed to board the buses. Various human rights organisations that are fighting against violations by paramilitary forces and police in different states today came together and passed a resolution for abolition of capital punishment, stopping misuse of sedition laws and setting up of independent tribunals for free and fair probe into such cases. The contractor Vishesh Kumar maintaining the Nurpur Bedi-Bunga Sahib road was fined Rs 65 lakh by PWD authorities for breaching the agreement. Taking a serious note of the instance in which Satkar Committee members stopped a publisher’s consignment alleging sacrilege, the Sikh clergy has issued guidelines to private publishers for sending religious books to other places. The Punjab Consumer Disputes Redressal Commission has ordered the Naaptol Online Shopping Company, Mumbai, to refund the cost of a television set (Rs 7298) and pay 9 per cent interest to Manpreet Kaur, a resident of Tapa, for having sent her newspaper trash in a parcel instead of the ordered television set. Two immigration agents Rajvinder Singh and Lalli duped Karam Singh, a resident of Kot Bajwara, of Rs 1.5 lakh on the pretext of sending his son abroad. The police has booked the two, who are residents of Takhtu Majra in Rajpura, in this regard. Khalra Station House Officer Jagdish Raj was among four policemen dismissed from service for allegedly registering false cases against two persons. Municipal Commissioner DP Gupta confirmed that the PRTS route from railway station to the Golden Temple had been changed and that Katra Jaimal Singh area had been dropped from the plan. He, however, did not elaborate on the new plan. The change has been made apparently in view of Katra Jaimal Singh residents objecting to it, contending that it involved a lot of digging work and, therefore, will lead to chaos in the area. Interestingly, the local Municipal Corporation (MC) does not seem to have kept in loop ULTra Fairwood Pte Ltd, the company executing the project, regarding the change in route. Project Director Ashish Kumar from ULTra Fairwood Pte Ltd said, "We don't know about any latest change in the route plan for the PRTS." He said he had no clue as to what alternative route the MC had adopted after dropping Katra Jaimal Singh area. The project, however, has not made any headway after its foundation stone was laid in December last year prior to the Punjab Assembly elections. As per the original plan for railway station-Golden Temple route, the PRTS guideway was supposed to enter into the walled city through the Hall Gate. But following voices of dissent from heritage lovers, besides the traders from Hall Bazaar, it was changed. While heritage lovers contended that the guideway will eclipse the view of significant landmarks like Golden Temple and Jallianwalla Bagh, traders felt it will leave an adverse impact on their business. The route was changed for the first time a few months back, as per which the PRTS guideway instead of entering into the walled city through the Hall Gate were to take a left turn towards Chitra Cinema and get into the walled city through Rambagh Chowk. From there, it was to pass through Bijliwala Chowk to reach Katra Jaimal Singh area before heading towards the Golden Temple. Now, in the latest change, Katra Jaimal Singh has been dropped. However, the PRTS route from bus stand to the Golden Temple remains the same, i.e. through Jagat Jyoti School and Town Hall. As far as concerns of heritage lovers are concerned, the ULTra Fairwood Pte Ltd has already clarified that the guideway will now span across the approach road to the Jallianwalla Bagh and the Golden Temple to facilitate the clear view of these landmarks. Besides, the height of the guideway will be raised to 30 feet on both these stretches, as against the height of 20 feet in other sections of the route. On the apprehensions of the traders, the company said the PRTS is based on steel design rather than concrete. Therefore, it has slender, lightweight and unobtrusive pillars holding up a track that is more like a footpath in weight than a road. And because the structure is of steel, it is fabricated offsite and erected quickly and cleanly on the site. The company hopes to kick-start the work on the PRTS project within next four months. The ULTra (Urban Light Transport) PRT System is basically a four to six-seater driverless, battery-powered, laser-guided vehicle with a central control system known as magnetic pod that uses rubber wheels running on an elevated guide way. To operate a pod, a commuter, waiting off-line at a station, will get access control using a swipe card and can key in destination on platform station. After this, pod selects the most economical route for specific destination. The project will be developed by a firm named ULTra. The PRT is like a personal taxi, which is demand responsive to a commuter, meaning it can facilitate on-demand non-stop journey within the track network with operational flexibility. Bhattal, who is only a legislator now, was served an eviction notice yesterday, asking her to vacate immediately Bungalow Number 46, situated adjacent to the Chief Minister’s residence. She has been served two notices earlier also. This time, she would be liable for penalty in case of overstay. Earlier accused of going soft on Akalis, Bhattal today accused Chief Minister Parkash Singh Badal getting registered two false cases against her earlier. She alleged that Badal was also, through the house row, conspiring to create rift among the Opposition leaders. She claimed that her house had been allotted to Jakhar with the same purpose. Bhattal claimed that the Punjab Government was falsely stating that the house occupied by her was earmarked for the Leader of the Opposition in the Assembly. She claimed that she had remained the CLP Leader only for six years, though she had been living there for the past 19 years. “I lived here even when I was the Chief Minister,” she said. “Badal used to live in ministerial Bungalow Number 50 when he was the opposition leader. Why was that house not earmarked for the CLP leader,” she asked. Bhatttal went to the extent of saying that the Chief Minister was “victimising a widow and the daughter of a freedom fighter” despite the fact that his own government had passed a resolution in the Vidhan Sabha to allocate a special house for former CMs. She said several people continued to overstay in official accommodations due to varied reasons and that in her case, it was because of the “threat perception” to her. “Let the state government tell me there is no risk to my security. If that’s the case, I will live in a tent outside my residence,” she said. Jakhar, who had earlier been allocated the house occupied by former Punjab Police chief PS Gill, is not keen on shifting there any longer. That so because the entire office complex, built by the police to facilitate their DGP, had been uprooted and all fixtures dismantled. The office complex is not likely to be rebuilt. Jakhar said he had only agreed to occupy the former DGP's residence when he came to know that it had an office complex. The CLP Leader said the only official information he had received was that he had been allocated the house occupied currently by Bhattal. He said, “I am not requesting for official accommodation. It is the duty of the government to provide me the same if it is really serious about the role of the opposition." Hundreds of cases of change of land use (CLU) are likely to be addressed now with the BJP prevailing upon its alliance partner, the SAD, to reverse the government decision to deposit funds collected from CLU approvals to the state exchequer. Now, the money will be retained by the respective municipal bodies. CLU cases had been piling up in the office of Local Bodies Minister Bhagat Chunni Lal for several months. The Congress had also objected to the "indecisiveness" of the government. Sources in the BJP said senior BJP leaders, including former minister Balramji Dass Tandon, took up the issue with Chief Minister Parkash Singh Badal and Deputy Chief Minister Sukhbir Badal at a recent coordination meeting between the alliance partners. They said the BJP insisted that the municipal corporations were in dire financial straits and they needed the money earned from clearing CLU cases to initiate development works. It was also pointed out that earlier too the money received from CLU cases was retained by the municipal bodies. The BJP has also persuaded its alliance partner that funds from CLU cases of housing colonies established by the Punjab Urban Development Authority (PUDA) within the municipal limits should be retained by the municipal bodies. Tandon said both the Chief Minister and the Deputy Chief Minister had agreed to these suggestions. The BJP had also pointed out in the coordination meeting that the Ludhiana Mayor, Local Bodies Minister Bhagat Chunni Lal and Chief Parliamentary Secretary, Local Bodies, had not been invited to a meeting held by Sukhbir Badal to finalise a Rs 3,561-crore integrated development plan for Ludhiana. All the three are BJP functionaries. The BJP leaders said this gave an impression that the party was not part of the exercise which would send a wrong message to the public. Concerns on more representation to the BJP in the Advocate-General's office was also expressed and well taken by the SAD. Both the parties also decided to hold monthly meetings of the coordination committee. BJP state president Ashwani Kumar Sharma has been asked to convene the meetings. It was also decided that coordination meetings would be held at the district level. Chief Minister's adviser Kamal Sharma and party secretary Dr Daljit Singh Cheema have been nominated to give names for the same for all districts on behalf of the BJP and the SAD, respectively. Non-Conventional Energy Minister Bikram Singh Majithia said the revolutionary policy would not only change the energy scene of Punjab but also generate more employment avenues. Besides attracting large investments, it would also generate 10 per cent of the total power installed capacity, thus bridging the gap between demand and supply, he said. Reiterating the commitment of the SAD-BJP government to produce power from paddy straw, Majithia said the state's agriculture scene was dominated by wheat-paddy cycle, producing more than 10 million tonnes of paddy straw. He said it was estimated that huge quantities of surplus agro residues (including rice straw) produced annually could also generate decentralised power of more than 600 MW. Majithia said the policy would be exceptionally beneficial for the farmers as well as entrepreneurs of the state who have been offered huge incentives for setting up the plants. Under this policy, various incentives being offered would include 100 per cent waiver of electricity duty for power consumed during construction and testing of the project. He said these projects would be exempted from value added tax (VAT) and any cess thereupon. 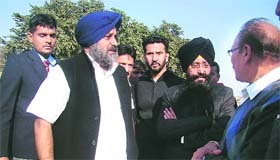 Talking to mediapersons at his party office here, Manpreet said, "We have neither held talks with the Congress nor with the Bahujan Samaj Party as both the outfits have made it clear that they will have to seek an approval from their high commands before holding any such dialogue." 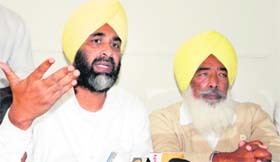 Manpreet also ruled out any possibility of his joining any other party. "I will continue to strive towards the goals to achieve which the party was launched. There is no question of backtracking from the agenda," he said. He said the Sanjha Morcha will hold a conference in Jalandhar on December 5 to deliberate on the issues facing the state. "We have prepared a draft, which will be presented in the conference," he said. The PPP president said the Sanjha Morcha will subsequently hold public meetings in all district headquarters of the state from December 10 to 17 to sensitise the people on these issues. Manpreet Badal, a former Finance Minister of Punjab, has claimed that the foreign direct investment (FDI) in retail sector was beneficial for the state as well as its farming community. He said as Punjab was passing through a critical financial scenario, the state government must focus on cutting its own expenses instead of adding to the tax burden of the common man. "Power tariff has already been increased whereas more taxes are in the offing," he said. While inspecting work on a road along the Sirhind canal here, Sukhbir said, "Quality should not be compromised with in any work…. The Punjab Government has decided to widen all roads along the canals in the state for the benefit of the rural population." The Deputy Chief Minister also issued directions to the officials to hasten work on the road along the Ropar-Neelon-Doraha canal. "During the second tenure of the SAD-BJP government, our main focus is on strengthening road infrastructure so as to make Punjab the epicentre of investment," he said. By December next year, 1,600 km of the total 1,703 km of national highways in the state would be four-laned. The Deputy Chief Minister has said that a drive will be launched against putting up of illegal hoardings and stern action would be initiated against those behind the activity. Dr Verka today met the bereaved families. He alleged the mishap occurred due to negligence on part of the officials concerned. He said he had sought initiation of criminal proceedings under the SC/ST (Prevention of Atrocities) Act against the officers concerned and the contractor responsible for the mishap. The official said despite instructions safai karamcharis were being allowed to enter the sewer lines without wearing mask and gloves. They were not even provided basic safety equipment. Dr Verka lashed out at the Punjab Government for "not taking" such mishaps seriously. He also alleged failure on part of the government in the implementation of various social welfare schemes. Forest Minister Surjit Kumar Jayani has ordered the complete reorganisation of the forest beat system which has been prevailing in the Forest Department since the British times. The beats are the lowest organisational units of the department held by forest guards. Forest beats were constituted to include only government forest areas whereas other non-forest land, including that belonging to panchayats and government institutions, was not covered. The pilgrims were enthusiastic about their visit. They said they were not concerned by any threat. "We are going to pay obeisance at our holy shrines which every Sikh wishes to visit at least once in his lifetime," they added. SGPC president Avtar Singh Makkar has already written a letter to Prime Minister Manmohan Singh and Pakistan Prime Minister Raja Parvez Ashraf, urging them to take necessary measures to ensure security of the pilgrims. Meanwhile, the pilgrims had a tough time boarding the train to Pakistan. The pilgrims started reaching the station as early as 9 am, but there was no sign of train till 11 am. When railway officials said they had no idea about the train's arrival in Amritsar, the harried pilgrims started boarding taxis, auto-rickshaws and other modes of transport to reach the Attari railway station. Later, the SGPC arranged buses for sending the pilgrims to Attari. Irked by the confusion, a section of pilgrims resorted to sloganeering against the Central Government and the SGPC at the Attari railway station. The first train from Pakistan arrived at Attari at 12.40 pm and left for Pakistan at 2.45 pm. The second train, however, arrived at the Amritsar railway station after 2 pm, but by that time most of the pilgrims had left the city for Attari. The train subsequently left for Attari. Earlier, the SGPC jatha began its journey from the SGPC headquarters in the presence of SGPC secretary Dalmegh Singh. 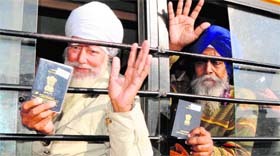 He said visas were denied to 971 pilgrims out of 1,860 applications forwarded by the SGPC to the Pakistan Embassy. The SGPC secretary said the jatha would pay obeisance at Nankana Sahib and Gurdwara Sacha Sauda on December 26. It would visit Gurdwara Panja Sahib on November 29 and Gurdwara Dehra Sahib, Lahore, on November 30 before returning on December 4. The minister said the government was not only committed to provide quality education but also to ensure timely and safe transportation of students to their respective educational institutions. 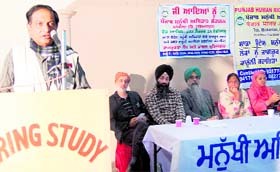 The resolution was passed in a conference on ‘Human rights and laws’ organised by the Khalra Mission Organisation here. Prominent among those who attended the conference was human rights activist from Chhattisgarh Binayak Sen. Addressing the gathering, Sen alleged that sedition laws were being misused in the country. He alleged that human rights were being violated in the name of sedition laws. Giving an example of his own case, he said he was a pediatrician and had been working in the tribal belt. “I raised my voice for the rights of tribals, but was booked under sedition laws,” he said. Sen was released following the directions of the Supreme Court. Parveen Hangar from the Association of Parents of Disappeared Persons, Kashmir, alleged that over 10,000 persons, most of them youth, had “disappeared” in Srinagar alone. She revealed that her own son Javed Hamid Hangar had been missing since August 18, 1990. She alleged that he was taken away by the security forces, following which there was no information about him. “Are laws only framed for the common man? Don’t they apply on the security forces,” she asked. She alleged large-scale human rights violations in the Kashmir valley. Advocate Navkiran Singh from Lawyers for Human Rights, advocate Colling Gonzalves from Human Rights Law Network and advocate RS Bains from Punjab Human Rights Organisation demanded that the capital punishment should be abolished in India and said the prisoners should instead be given an opportunity to reform themselves. “Death penalty is being awarded for killing a VIP, but those involved in murder of a common man are being given some other sentence,” they said. They alleged that there were political interests behind decisions being taken on mercy petitions. They also spoke against hanging 26/11 convict Ajmal Kasab while saying that he should have been given a chance to reform. Khalra Mission chief Bibi Paramjit Kaur Khalra spoke out against fake encounters and torture by police and paramilitary forces. Later, Binayak Sen paid obeisance at the Golden Temple. Kumar laid the road under Pradhanmantri Gram Sadak Yojna and was liable for its maintenance till five years after its completion. RTI activist Dinesh Chadha said the road was constructed by the contractor in 2009 at a cost of Rs 3.34 crore. The road, however, was completely washed out merely a year later, he said. Chadha brought the matter to the notice of the authorities following which an inquiry was conducted and Kumar was asked to repair the road at his own cost but to no avail. 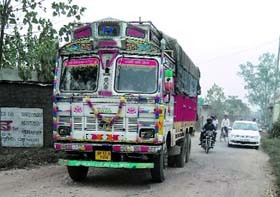 Kumar in his defence had contended that the sudden increase in the number of heavy transport vehicles plying on the road had damaged the road and the company was not liable to bear the cost of its repair, said Ropar PWD superintending engineer Arvinder Pal Singh adding that the authorities set aside his claim and penalised him. Singh said despite repeated notices to the contractor Vishesh Kumar, he failed to repair the road and the authorities forfeited his security worth Rs 17 lakh and is in the process of recovering the balance. The complaint was lodged in the month of March and an inquiry was completed by Punjab Mandi Board superintending engineer Subhash Mahajan. Mahajan indicted the contractor for breach of agreement and submitted the report to PWD Chief Engineer who ordered that the road be repaired and its cost should be recovered from the contractor, he said. RTI acitivist Chadha demanded that to bring in transparency, every new road should have display boards providing information about the contractor and the terms and conditions of its maintenance. Following a meeting at the Akal Takht Secretariat here, the Sikh high priests issued directions to the publishers to ensure that whenever they prepared a consignment, each packet should not weigh more than 20-25 kg. The literature should be first wrapped in paper and cloth before being put into a box made of wood or plastic. Subsequently, these books should be transported in a properly covered vehicle so as to protect them from dust or rain. The publishers have also been told to put up stickers having written ‘Handle with respect’ on each of the packets. 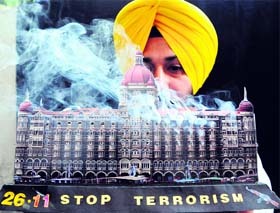 The Sikh clergy has warned of strict action against anyone violating the directions. In another significant decision, the Sikh high priests have directed that Guru Granth Sahib should not be installed at houses that had ‘bars’. Akal Takht Jathedar Giani Gurbachan Singh said such individuals should hand over the ‘bir’ of Guru Granth Sahib to the nearest gurdwara. He said such people can keep ‘Gutkas’ in their homes instead of installing the holy book. The Punjab Consumer Disputes Redressal Commission has ordered the Naaptol Online Shopping Company, Mumbai, to refund the cost of a television set (Rs 7298) and pay 9 per cent interest to Manpreet Kaur, a resident of Tapa, for having sent her newspaper trash in a parcel instead of the ordered television set. The company has also been ordered to pay Rs 10,000 as the litigation cost. The accused are at large and the police was conducting raids to arrest them. Assistant Sub Inspector (ASI) Ram Lal at Fatehgarh Police station said that Karam Singh had struck a deal with immigration agents Daljit Singh and Balveer Singh, to send his son Satvinder Singh to Belgium for Rs 4 lakh. The duo demanded Rs 1.5 lakh up front and the rest when Satvinder landed in Belgium, Karam Singh alleged. The victim alleged that as per the deal he gave Rs 1.5 lakh to the two accused Daljeet Singh and Balveer Singh who got him a visa issued for Belgium that later turned out to be fake. He said two other immigration agents Rajvinder Singh and Lalli were also involved in the deal. The victim said after a lapse of seven months, Daljeet and Balveer told him that the visa was fake and never returned his money. ASI Ram Lal said investigations showed that Rajvinder and Lalli were guilty of attaching the fake visa. He said a case under Sections 406 and 420 of the IPC and Section 24 of the Immigration Act against the two had been registered. All the four policemen, including Sursing police post incharge Kamalnain Singh and head constables Hazara Singh and Dilbag Singh (apart from the SHO), have been booked under various sections of the IPC and Prevention of the Corruption Act. The police would be initiating departmental action against the fifth policeman allegedly involved in the case, constable Rupinder Singh. The accused had registered a case under the Excise Act against two persons even though they had allegedly killed four persons in Uttarakhand. Inspector General (border zone) RP Mittal gave this information while addressing a press conference here today.